This article is about the historical region comprising north-eastern Iran and central Asia. For the Iranian province of Khorasan, see Khorasan Province. For other uses, see Khorasan (disambiguation). Khorasan (Middle Persian: Xwarāsān; Persian: خراسان‎ Xorāsān, Persian pronunciation: [xoɾɒːˈsɒːn] listen (help·info)), sometimes called Greater Khorasan, is a historical region lying in northeast of Greater Persia, including part of Central Asia and Afghanistan. The name simply means "East, Orient" (literally "sunrise") and loosely includes the territory of the Sasanian Empire north-east of Persia proper. Early Islamic usage often regarded everywhere east of so-called Jibal or what was subsequently termed 'Iraq Ajami' (Persian Iraq), as being included in a vast and loosely-defined region of Khorasan, which might even extend to the Indus Valley and Sindh. During the Islamic period, Khorasan along with Persian Iraq were two important territories. The boundary between these two was the region surrounding the cities of Gurgan and Qumis (modern Damghan). In particular, the Ghaznavids, Seljuqs and Timurids divided their empires into Iraqi and Khorasani regions. The main cities of Khorasan in the Islamic period were Balkh and Herat (now in Afghanistan), Mashhad and Nishapur (now in northeastern Iran), Merv and Nisa (now in southern Turkmenistan), and Bukhara and Samarkand (now in southern Uzbekistan). The cities of Merv and Nisa have since been abandoned but the other cities remain integral parts of their respective states. The term Khorasan tended to further extend from these urban centers into the rural regions of their respective west, east, north and south. Sources from the 10th-century onwards refer to areas in the south of the Hindu Kush as the Khorasan Marches, forming a frontier region between Khorasan and Hindustan. Greater Khorasan is today sometimes used to distinguish the larger historical region from the modern Khorasan Province of Iran (1906–2004), which roughly encompassed the western half of the historical Greater Khorasan. First established in the 6th-century as one of four administrative (military) division by the Sassanids, the scope of the region has varied considerably during its nearly 1,500-year history. Initially, the Khorasan division of the Sassanid empire covered the north-eastern military gains of the empire, at its height including cities such as Nishapur, Herat, Merv, Faryab, Talaqan (around modern Turkmenabat), Balkh, Bukhara, Badghis, Abiward, Gharjistan, Tus, Sarakhs and Gurgan. With the rise of the Umayyad Caliphate, the designation was inherited and likewise streched as far as their military gains in the east, starting off with the military installations at Nishapur and Merv, slowly expandning eastwards into Tokharistan and Sogdia. Under the Caliphs, Khorasan was the name of one of the three political zones under their dominion (the other two being Eraq-e Arab "Arabic Iraq" and Eraq-e Ajam "Non-Arabic Iraq or Persian Iraq"). Under the Umayyad and Abbasid caliphates, Khorasan was divided into four major sections or quarters (rub′), each section based on a single major city: Nishapur, Merv, Herat and Balkh. By the 10th-century, Ibn Khordadbeh and the Hudud al-'Alam mentions what roughly encompasses the previous regions of Abarshahr, Tokharistan and Sogdia as Khwarasan proper. They further report the southern part of the Hindu Kush, i.e. the regions of Sistan, Ghor, Rukhkhudh, Zabulistan and Kabul etc. to make up the Khwarasan marches, a frontier region between Khwarasan and Hindustan which at the time would have been in a process of Islamization. "The people of Hindustān call every country beyond their own Khorasān, in the same manner as the Arabs term all except Arabia, Ajem. On the road between Hindustān and Khorasān, there are two great marts: the one Kābul, the other Kandahār. Caravans, from Ferghāna, Tūrkestān, Samarkand, Balkh, Bokhāra, Hissār, and Badakhshān, all resort to Kābul; while those from Khorasān repair to Kandahār. This country lies between Hindustān and Khorasān." In modern times, the term has been source of great nostalgia and nationalism, especially amongst the Tajiks of Central Asia. Many Tajiks regard Khorasan as an integral part of their national myth, which has preserved an interest in the term, including its meaning and cultural significance, both in common discussion and academia, despite its falling out of political use in the region. According to Ghulam Mohammad Ghobar, Afghanistan's current Persian-speaking territories formed the major portion of Khorasan, as two of the four main capitals of Khorasan (Herat and Balkh) are now located in Afghanistan. Ghobar uses the terms "Proper Khorasan" and "Improper Khorasan" in his book to distinguish between the usage of Khorasan in its strict sense and its usage in a loose sense. According to him, Proper Khorasan contained regions lying between Balkh in the east, Merv in the north, Sistan in the south, Nishapur in the west and Herat, known as the Pearl of Khorasan, in the center. Improper Khorasan's boundaries extended to as far as Hazarajat and Kabul in the east, Baluchistan in the south, Transoxiana and Khwarezm in the north, and Damghan and Gorgan in the west. Before the region fell to Alexander the Great in 330 BC, it was part of the Persian Achaemenid Empire and prior to that it was occupied by the Medes. The land that became known as Khorasan in geography of Eratosthenes was recognized as Ariana by Greeks at that time, which made up Greater Iran or the land where Zoroastrianism was the dominant religion. The southeastern region of Khorasan fell to the Kushan Empire in the 1st century AD. The Kushan rulers built a capital in modern-day Afghanistan at Bagram and are believed to have built the famous Buddhas of Bamiyan. Numerous Buddhist temples and buried cities have been found in Afghanistan. However, the region of Khorasan remained predominantly Zoroastrian but there were also Manichaeists, sun worshippers, Christians, Pagans, Shamanists, Buddhists, Jews, Hindus and others. One of the three great fire-temples of the Sassanids "Azar-burzin Mehr" is situated near Sabzevar in Iran. The boundary of the region began changing until the Kushans and Sassanids merged to form the Kushano-Sassanian civilization. During the Sasanian era, likely in the reign of Khusrow I, Persia was divided into four regions (known as kust Middle Persian), Khwārvarān in the west, apāxtar in the north, nīmrūz in the south and Khurasan in the east. Since the Sasanian territories were more or less remained stable up to Islamic conquests, it can be concluded that Sasanian Khorasan was bordered to the south by Sistan and Kerman, to the west by the central deserts of modern Iran, and to the east by China and India. In Sasanian era, Khurasan was further divided into four smaller regions, and each region was ruled by a marzban. These four regions were Nishapur, Marv, Herat and Balkh. Khorasan in the east saw some conflict with the Hephthalites who became the new rulers in the area but the borders remained stable. Being the eastern parts of the Sassanids and further away from Arabia, Khorasan region was conquered after the remaining Persia. The last Sassanid king of Persia, Yazdgerd III, moved the throne to Khorasan following the Arab invasion in the western parts of the empire. After the assassination of the king, Khorasan was conquered by Arab Muslims in 647 AD. Like other provinces of Persia it became a province of the Umayyad Caliphate. The first movement against the Arab conquest was led by Abu Muslim Khorasani between 747 and 750. He helped the Abbasids come to power but was later killed by Al-Mansur, an Abbasid Caliph. The first independent kingdom from Arab rule was established in Khorasan by Tahir Phoshanji in 821, but it seems that it was more a matter of political and territorial gain. Tahir had helped the Caliph subdue other nationalistic movements in other parts of Persia such as Maziar's movement in Tabaristan. Other major independent dynasties who ruled over Khorasan were the Saffarids from Zaranj (861–1003), Samanids from Bukhara (875–999), Ghaznavids from Ghazni (963–1167), Seljuqs (1037–1194), Khwarezmids (1077–1231), Ghurids (1149–1212), and Timurids (1370–1506). Some of these dynasties were not Persian by ethnicity. The periods of Turkic Ghaznavids and Turco-Mongol Timurids are considered as some of the most brilliant eras of Khorasan's history. During these periods, there was a great cultural awakening. Many famous poets, scientists and scholars lived in this area. Numerous valuable works in Persian literature were written. Between the early 16th and early 18th centuries, parts of Khorasan were contested between the Safavids and the Uzbeks. A part of the Khorasan region was conquered in 1722 by the Ghilji Pashtuns from Kandahar and became part of the Hotaki dynasty from 1722 to 1729. Nader Shah recaptured Khorasan in 1729 and chose Mashhad as the capital of Persia. Following his assassination in 1747, the eastern parts of Khorasan, including Herat was annexed with the Durrani Empire. Mashhad area was under control of Nader Shah's grandson Shahrukh Afshar until it was captured by the Qajar dynasty in 1796. 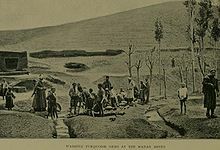 In 1856, the Iranians, under the Qajar dynasty, briefly recaptured Herat; by the Treaty of Paris of 1857, signed between Iran and the British Empire to end the Anglo-Persian War, the Iranian troops withdrew from Herat. Later, in 1881, Iran relinquished its claims to a part of the northern areas of Khorasan to the Russian Empire, principally comprising Merv, by the Treaty of Akhal (also known as the Treaty of Akhal-Khorasan). Khorasan has had a great cultural importance among other regions in Greater Iran. The literary New Persian language developed in Khorasan and Transoxiana and gradually supplanted the Parthian language. The New Persian literature arose and flourished in Khorasan and Transoxiana where the early Iranian dynasties such as Tahirids, Samanids, Saffirids and Ghaznavids (a Turco-Persian dynasty) were based.The early Persian poets such as Rudaki, Shahid Balkhi, Abu al-Abbas Marwazi, Abu Hafas Sughdi, and others were from Khorasan. Moreover, Ferdowsi and Rumi were also from Khorasan. Until the devastating Mongol invasion of the thirteenth century, Khorasan remained the cultural capital of Persia. It has produced scientists such as Avicenna, Al-Farabi, Al-Biruni, Omar Khayyam, Al-Khwarizmi, Abu Ma'shar al-Balkhi (known as Albumasar or Albuxar in the west), Alfraganus, Abu Wafa, Nasir al-Din al-Tusi, Sharaf al-Dīn al-Ṭūsī, and many others who are widely well known for their significant contributions in various domains such as mathematics, astronomy, medicine, physics, geography, and geology. Khorasan artisans contributed to the spread of technology and goods along the ancient trade routes and decorative objects have been traced to this ancient culture, including art objects, textiles and metalworks. Decorative antecedents of the famous "singing bowls" of Asia may have been invented in ancient Khorasan. In Islamic theology, jurisprudence and philosophy, and in Hadith collection, many of the greatest Islamic scholars came from Khorasan, namely Abu Hanifa, Imam Bukhari, Imam Muslim, Abu Dawood, Al-Tirmidhi, Al-Nasa'i, Al-Ghazali, Al-Juwayni, Abu Mansur Maturidi, Fakhruddin al-Razi, and others. Shaykh Tusi, a Shi'a scholar and Al-Zamakhshari, the famous Mutazilite scholar, also lived in Khorasan. ^ a b Bosworth, C.E. (1986). Encyclopedia of Islam, Vol 5, Khe – Mahi (New ed.). Leiden [u.a. ]: Brill [u.a.] pp. 55–59. ISBN 90-04-07819-3. ^ "Khorasan". Encyclopædia Britannica Online. Retrieved 2010-10-21. historical region and realm comprising a vast territory now lying in northeastern Iran, southern Turkmenistan, and northern Afghanistan. The historical region extended, along the north, from the Amu Darya (Oxus River) westward to the Caspian Sea and, along the south, from the fringes of the central Iranian deserts eastward to the mountains of central Afghanistan. Arab geographers even spoke of its extending to the boundaries of India. ^ a b Minorsky, V. (1937). Hudud al-'Alam, The Regions of the World: A Persian Geography, 372 A.H. - 982 A.D. London: Oxford UP. ^ a b Zahir ud-Din Mohammad Babur (1921). "Events Of The Year 910". Memoirs of Babur. Translated by John Leyden; William Erskine. Packard Humanities Institute. Retrieved 2010-08-22. ^ Rezakhani, K. (2017). Reorienting the Sasanians: East Iran in Late Antiquity. Edinburgh: Edinburgh University Press. ISBN 978 1 4744 0029 9. ^ a b c Authors, Multiple. "Khurasan". CGIE. Retrieved 9 March 2017. ^ a b Ghubar, Mir Ghulam Mohammad (1937). Khorasan, Kabul Printing House. Kabul, Afghanistan. ^ "42 Buddhist relics discovered in Logar". Maqsood Azizi. Pajhwok Afghan News. August 18, 2010. Retrieved 2010-08-23. ^ "Buddhist remains found in Afghanistan". Press TV. August 17, 2010. Retrieved 2010-08-16. ^ Rippin, Andrew (2013). The Islamic World. Routledge. p. 95. ISBN 978-1-136-80343-7. ^ "Last Afghan empire". Louis Dupree, Nancy Hatch Dupree and others. Encyclopædia Britannica. Retrieved 2010-09-24. ^ Axworthy, Michael (2006). The Sword of Persia: Nader Shah, from Tribal Warrior to Conquering Tyrant. London: I.B. Tauris. p. 50. ISBN 1-85043-706-8. Retrieved 2010-09-27. ^ Avery, Peter; Hambly, Gavin; Melville, Charles, eds. (10 October 1991). The Cambridge History of Iran (Vol. 7): From Nadir Shah to the Islamic Republic. Cambridge University Press. pp. 183, 394–395. ISBN 978-0-521-20095-0. ^ Sicker, Martin (1988). The Bear and the Lion: Soviet Imperialism and Iran. Praeger. p. 14. ISBN 978-0-275-93131-5. ^ electricpulp.com. "DARĪ – Encyclopaedia Iranica". www.iranicaonline.org. Retrieved 13 June 2018.